The 821 Pleroma was created by Elijah Isham and it perfectly embodies his one-of-a-kind design aesthetic. It looks unlike any other knife in the industry and features We Knives' superb action and surprisingly good ergonomics. The dynamically stylized blade is made from Bohler M390 stainless steel with a Wharncliffe shape which will excel at utility cutting tasks. 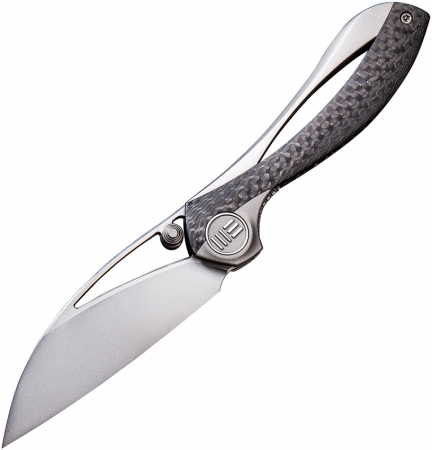 The handle is a single piece of milled titanium with a stainless steel liner lock and carbon fiber inlays. The pocket clip, backspacer, screws, pivot cap, and washers are all 6Al4V titanium for maximum quality assurance and you have a few different ways that you can open this incredible blade. Everything about this knife is well thought out and superbly executed, and we are proud to present it to you as your next everyday carry or maybe even safe queen.